Summer vacation is one of the best times to chill out, relax and relieve stress, in which beaches are the most visited place because of its soothing view and cool wind caressing your skin. Santa Monica Island seems perfect for vacationers searching for a very relaxing place to spend summer or have adventure through its white sand beaches, big waves, natural-made swimming pools, crystal clear water and admirably beautiful rock formations. 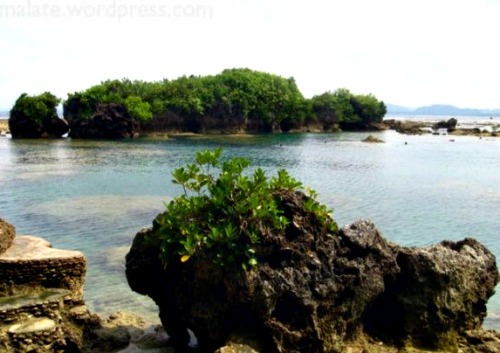 The 13-hectare paradise, which is about 15 kilometers away from the mainland of Oras town, is worth the trip during the summer. Oras is a fourth class town in Eastern Samar province, located 174 kilometers northeast of Tacloban City, the regional capital. It takes four hours from Tacloban to Oras town, through a view of lush green scenery. Arriving at the town proper, you can have the sweet touch of a paradise-like experience within 45 minutes via a pump boat ride from the coastline of the town center to the island. The van fare from Tacloban City to Oras costs PHP200 and PHP150 through bus. The fare for the pump boat costs only PHP30. While traveling by boat, the island looks like a long clay carved by minute trees standing on it. But a view from above, the island looks like a fish, and the houses are like miniatures attached to the land. With the island’s fascinating beauty, people will be tempted to dive immediately into the crystal clear waters with coral reefs full of fish. There is also an islet called “inuktaban” located about 100 meters from Santa Monica, which has creamy white irresistible sand. This is where most vacationiers come and enjoy a beach party because of the perfect ambiance for relaxation and swimming. Children often love to play with the white sand -- building sand castles or applying sand to their bodies. The island is not only rich in eye-captivating scenes, but also has abundant marine resources being located beside the Pacific Ocean. Most residents get their income from fishing and selling the catch in the town center. Someone who craves crabs, lobsters and shrimps, and wants to taste different ways of cooking these seafood definitely needs to pay a visit to the small paradise of Santa Monica. Santa Monica island does not only boast of its marvelous area and scenery, but also of its hospitable and ever smiling locals. “Tobabaonons,” as they are referred to, are simple-living people always smiling and not minding the tough problems they face. Such island is named after their patron saint, the venerable Saint Monica who wiped the face of Jesus with her handkerchief when Jesus carried the Cross to Mount Calvary.